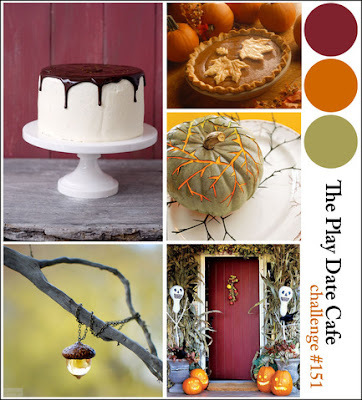 Play Date Cafe Color Challenge! It's hard to see in my picture, but each outer layer is a bit higher than the one previous! So, the "thank you" layer is adhered right to my card base. Then, the next (middle) layer is popped up with one dimensional. The outside is popped up with two dimensionals! It looks really cool in person!! Thanks, Elizabeth, for doing the sketches in September!! Sorry--back to snowflakes! I just can't help it! I love this set!! Be sure to head over to the UDI Blog and check out the fun stuff there!!! Happy Friday!! 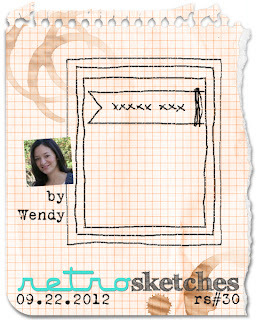 And welcome to a new version of our Sketch Frenzy Friday Challenge!! We're changing things up a bit! Instead of a blog hop, we're making it easier on you--just head over to the Sketch Frenzy Friday blog, and you'll be able to see all of the design team's cards there!! We hope this will make it easier for you! Please let us know what you think! And, look--no snowflakes! This time, I used the Toxic Treats Stamp set--it's so much fun! And, check out my black rhinestones! I colored the rhinestones with a black Sharpie!! Cool, huh?!! I love pink Christmas cards! They were my Granny's favorite, and I always made them for her to send to her friends and family. I sure do miss her! You can't see it in the pictures, but I used irredescent ice embossing powder over the Melon Mambo snowflakes. Very sparkly in person! You can see what the others came up with HERE! This card also uses the sketch over at Retro Sketches!! It used this year's set for the Ronald McDonald Charities called "Moving Forward". For each set purchased, Stampin' Up! will donate $3 to the Ronald McDonald House Charities! What a great cause! I used the Triple Time Stamping technique for my card--so fun and easy to do! Please check out the rest of the team's creations HERE! 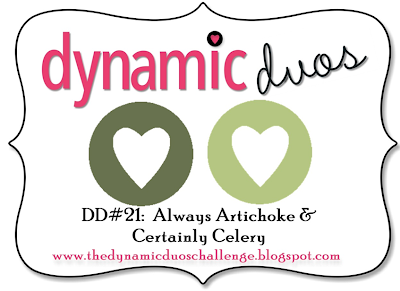 I used the Evergreen stamp set--I stamped the solid image with Certainly Celery ink, then stamped over with the outline stamp in Always Artichoke ink. After stamping, I went over the trees with Silver Sparkle Dazzling Details, and topped them with a Rhinestone! Very sparkly!!! Hi! 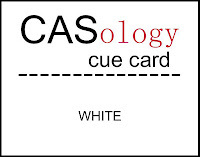 I found a fun new challenge blog: CASology! The challenge this week was "White". Good morning! I am so excited to share this card with you! I am feeling pretty brilliant right now! LOL!! Cardstock: Basic Gray, So Saffron, Sahara Sand & Very Vanilla; Neutrals & Subtles Designer Paper Stacks (So Saffron & Basic Gray) The Basic Gray is 4 1/4" x 11", and is scored at 2 3/4" & 5 1/2". the little scallops above the So Saffron strip is Sahara Sand, punched out with the Dotted Scallop Ribbon Border Punch. Have a wonderful weekend! We're off for baseball, driver's ed and maybe the state fair! !